Although younger women with breast cancer have the most to gain from receipt of optimal care, few data are available regarding their receipt of locoregional breast cancer treatments. We identified 317,596 women aged 18–64 who were diagnosed with invasive breast cancer at hospitals reporting to the National Cancer Database, a large national cancer registry, during 2004–2008. 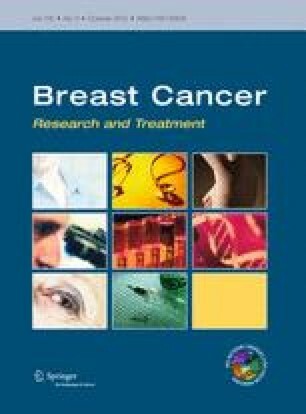 We used multivariable logistic regression to assess the association of patient age with mastectomy versus breast-conserving surgery (BCS), radiation with BCS, and postmastectomy radiation therapy (PMRT) with varying indications, adjusting for patient, clinical, and facility characteristics. Overall, 4 % of women were 35 years old or younger and 7 % were 36–40 years old. Women ≤age 40 were significantly more likely to have mastectomy than BCS compared with older women (57 % for age ≤35 and 52 % for ages 36–40 vs. 35 % for ages 61–64, adjusted odds ratio [OR] for age ≤35 = 2.03; 95 % confidence interval (CI) 1.93–2.14 and OR for ages 36–40 = 1.76; 95 % CI 1.69–1.84). Younger women were less likely to receive radiation if BCS was performed (69 and 73 vs. 80 %, OR for age ≤35 = 0.69; 95 % CI 0.65–0.74 and OR for ages 36–40 = 0.74; 95 % CI 0.70–0.78). For those who underwent mastectomy, overall rates of PMRT were low, although women ≤age 35 and ages 36–40 (vs. ages 61–64) were more likely to receive PMRT regardless of clinical indications. Our study suggests that young women with breast cancer may not be receiving optimal locoregional therapy. Efforts are needed to confirm these findings, further understand barriers to care, and increase the receipt of appropriate adjuvant radiation therapy among young women to improve their disease-free and overall survival. We thank the National Cancer Data Base staff and American Cancer Society for their collaboration on this study and for their ongoing development, maintenance, and improvement of this registry. This study was funded by the Susan G. Komen for the Cure Foundation and American Cancer Society Intramural Research Funding.